French talent Clara Copponi claimed six French titles on the track as a cadette in 2014 and 2015 from the sprint to individual pursuit to points race. 2016 saw the 17-year-old step up to the junior level for the first time where she immediately tasted success on the road. In March Copponi stormed to the line to take the win at Trofeo Da Moreno - Piccolo Trofeo Alfredo Binda, and write her name in to the history books at the first ever winner of Junior Women's Nations Cup round. Before quickly backing up that result with fourth a week later at Gent-Wevelgem. From there her focus returned to the track and a tenth place finish at Fenioux Piste International in an elite race that included world champion Laura Trott and a number of rising stars in the women's omnium. 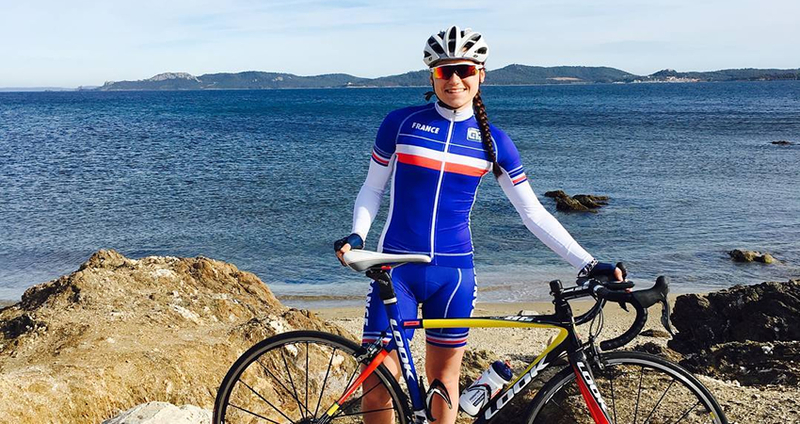 Two national titles at the French Championships followed, included her third individual pursuit title in a row. Positioning her well for the UCI Junior Track World Championships in Aigle, Switzerland. A bronze medal in the team pursuit to start her first world championship campaign put her on track to add to that in the omnium but an eighth place finished left Copponi short of her target of an individual medal. Despite the disappointment of missing an individual medal the experience has only served to motivate her for 2016. How did you first start cycling and how old were you? I started competing at the age of four in mountain biking. My big brother started and I just did like he did. I did it for seven years before starting on the road following my brother again. This season it will be 14 years that I do cycling. Raced the elite omnium at the Fenioux Piste International in May what was it like racing against World Champion Laura Trott? Yes I ran against Laura Trott, she is a truly spectacular woman! She's super strong in all events of the omnium. I'm a fan! You finished 10th ahead of a rider who had been on the podium at Junior Worlds and less than 20 points behind another Junior Worlds podium finisher do you think the experience there was a benefit ahead of Junior Worlds? Having raced against her and a big part of the team of Great Britain, Laurie Berton and others, really was a very rich experience and it was very useful for the rest of the season and for the Junior World Championship. Didn't race the European Junior Championships instead racing the French National Championships where you won national titles in the individual pursuit and 500m time trial did you take confidence from these results in to Junior Worlds? Having been champion of France of the two disciplines did not give me any confidence at all. I had no idea of the level that European girls could have in these disciplines and I did not ask. The track championships in France were on an uncovered wooden 250m track, nothing to do with the race one week later. In training I made good times, but I stress myself not to look at the time of the girls in Montichiari! I didn't want to put myself under unnecessary pressure! What were your goals for Junior Track Worlds? My goals were to get on the podium in the team pursuit (done) but also in the omnium. I am very disappointed with my individual result. Got Junior Worlds off to a good start with bronze in the team pursuit happy with how you and the team rode? Did claiming a medal in your first event at Junior Worlds ease the nerves and give you confidence ahead of the omnium? We were super happy indeed! After the catastrophic first round we all managed to motivate each other and get back in the game and ultimately finish third! We stuck together until the end and thanks to that we were on the podium! Although I was really happy I stayed focused until the end. I did not worry. I'm not the kind of person who gets anxious. I slept all week with my medal though! Consistent opening five rounds in the omnium were you happy with your performances in the first five events? I made many mistakes, but that's how you learn. I cannot say I'm satisfied because I am very disappointed with my final result. I just upgraded my time in the 500m, it's the only good point. Went in to the points race in sixth less than 20 points from the podium how were you feeling and what was your plan for the race? I was really out of shape, and I knew it was over for me. I still gave everything trying to attack but it was pointless. There was no tactics I just had to give everything and I finished exhausted. Finished the omnium eighth how did the points race go for you and were you happy with your overall performance in the omnium? I started the points race in sixth place and I finished eighth. To finish sixth or eighth is the same. We remember only the champions not those who make a top 10. So I am very disappointed but I am only a first year junior, I will come back even more motivated. What was the biggest challenge you faced and what is the most important thing you learnt at Junior Worlds? I learned that I had to stay focused throughout the competition and not be distracted. And the biggest challenge was to get on the podium and we did it, so I am very happy with that. Have been the French Champion in the individual pursuit the past three years is it your favourite event? One you feel you are strong in? I love the individual pursuit, it is a similar effort against the clock and I love that. But it's not my favourite race. I prefer the bunch races. Were the French Champion in the Cadettes sprint in 2014 do you think that sprint background is a benefit in your sprinting both in bunch races on the track and on the road? Have another year in the under 19 category is the omnium at Junior Track Worlds next year something you are looking at targeting? My goal for next year is of course to go to the Junior Track World Championships to participate in the omnium and this time I hope to show what I am capable of at my best and also injury free. Won Trofeo Da Moreno - Piccolo Trofeo Alfredo Binda back in March what did it mean to become the first winner of a round of the Junior Women's Nations Cup? It's just great to have won this race. It's the most beautiful of my young career without a doubt. Even more as I wasn't supposed to do it, I was substitute. And to win in Italy it's always been a dream as I have some Italian heritage and it's my favourite country! I am written in the history of my sport and that it is really fun. How do you find balancing both the road and the track? It's been a year that I am in the French training camp in endurance events, we work the whole year adapting the training our goals. It is with my coach that we manage all that.